There's something I really love about that quote. Have you ever noticed how children are drawn to feathers? They're really good at finding them. I think it has to do with being closer to the ground. Time flies by so quickly (the older you get the faster it goes), and birthdays, like feathers, drop in to remind us that yet another year has flown by. Last weekend I took a break from the blog to focus on family, in particular my daughter who turned four on Tuesday. Saturday morning, my parents and one of my brothers flew in to visit, and that afternoon was my daughter's birthday party at Sandy Hill Farm. There were pony rides (proper ones, not like four ponies attached to a carousel walking in circles like one party I went to as a child), petting/feeding animals, holding bunnies, and a hayride, with music, food and cake in the barn. Except instead of cake, my daughter requested cherries in the snow (which I made with my own whipped cream instead of cool whip). I think I'm going to go that route more often, seeing as even after doubling the recipe, there was barely any left to take home after the party. On her actual birthday, as per her request, I borrowed a pass from the library to the Morris Arboretum, and we spent the morning there as a family. Although I've been a number of times with the kids alone (or with friends), it's still special when we get to go with Daddy. I know that made her day so much more special to her, that he was home to spend her birthday with her instead of at work. She's definitely a daddy's girl. 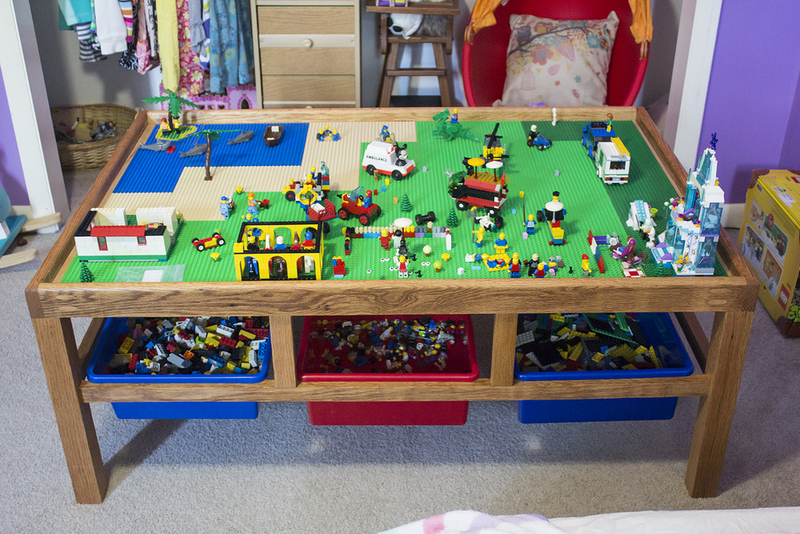 We introduced Legos to her about three weeks before her birthday, and my husband decided to build her a proper Lego table as part of her birthday gift. Using a train table I sourced off a yard sale group as a blueprint, he cleaned up some American Chestnut that we had salvaged from our previous house and built this one, reinforcing it in a few key places. The top is 1/4" plywood. We figured out how many plates we needed based on what we had, stopped at the Lego store to pick up what we were missing, decided on a layout (which included cutting some of the plates down with the bandsaw) and glued them down using contact cement and a few lego bricks to make sure the plates are aligned and spaced correctly. The bins underneath are from the train table. There's TONS of storage underneath, enough for all the pieces we had plus room to grow. The exposed wood was coated with Danish oil, then finished off with a DIY beeswax finish I found online (except I used jojoba oil instead of olive oil in ours, since it's not supposed to yellow as much). While he was working on the Lego table, I got to work on finishing this 2d needle-felted wall hanging, also as a gift. This was a project I started last summer, then put down when I was about halfway down at the owl's neck. I was having some difficulty with figuring out how I was going to finish the background as well as the bottom. 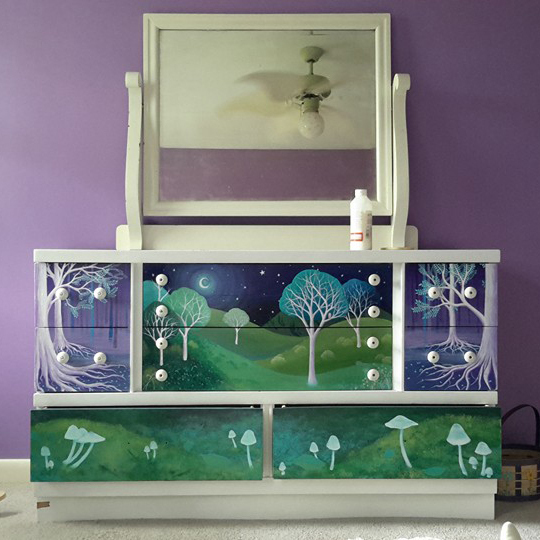 Then, while I was working on this, I got my hands on a dresser for her room, and focused on painting that instead (plus I completely redid her room from a baby room into a little girl's room with an owl theme). In any case, it only took me a few days of as much focus as possible with two kids, then attached a dowel at the top using cotton crochet thread. The fiber used (a variety of wools, including corriedale, merino, silk and a few others) comes from a variety of sources, mainly Living Felt, Peace Fleece and Weir Crafts. Once done and photographed, I shared it across a few facebook groups and with Living Felt, which put it in their weekly newsletter despite having only shared it with them the night before! The dresser I pained last year for my daughter. So in my little blurb with the post on the main blog page I mentioned future goodies. So guess what?! I set up a mount for a camera over my desk in preparation of filming the needle felting process. While I am definitely not expecting to become a YouTube star, let alone have the same following as Sara Renzulli (those of you who felt know who I'm talking about), I thought it would be a good way to show you the process behind my work. Maybe I'll video painting furniture as well! Anyway, it's all set up; now I just need to gain some courage to film myself while working.